Creativity and Innovation Thrive in Toronto - SchoolFinder.com! one of the most multicultural cities in the world? rated as one of the world’s safest and most livable cities? host of one of the most influential Film Festivals in the world? home to one in every three working design professionals in Canada? Toronto is Canada’s largest centre for design, culture and business. This vibrant nexus brings together a diversity of creative forces. And where great minds meet, magic happens. 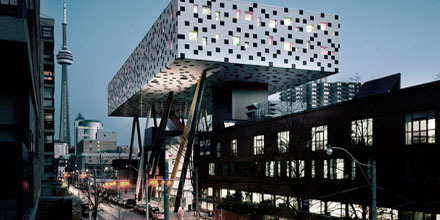 In the heart of this creative energy sits OCAD University – the country’s oldest and largest school of art and design, nicknamed Canada’s “University of the Imagination.” With undergraduate and graduate degree programs in design, fine art, visual culture and digital media, OCAD University offers unparalleled opportunities to learn from leading professionals in a variety of Toronto’s booming creative industries. Toronto nurtures cultural inventors and creative entrepreneurs. The city is emerging as a global hub for screen-based production and digital media, two of the three fastest-growing creative industries in Toronto. The city is home to countless galleries, art fairs and festivals. Each fall, the city’s free all-night celebration of contemporary art – Nuit Blanche – attracts over 1 million people to the streets. OCAD University students immerse themselves in many cultures. Our iconic building sits just steps from Chinatown, within walking distance of Little Portugal and Koreatown, and a short transit or bike ride to Little India and Greektown. Cultural festivals – including the largest Caribbean festival in North America – provide endless opportunities to learn about the world, all in one remarkable city. At OCAD University, we educate imaginations. Our graduates join a remarkable community of cultural leaders, innovators, creative thinkers and strategists who influence the future. Learn more at: www.ocadu.ca.